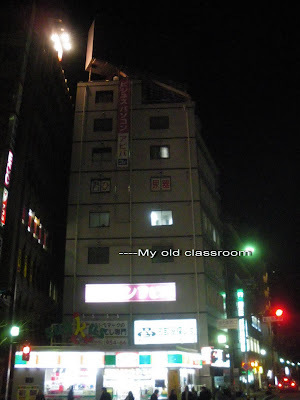 The internet (or at least that portion of the internet which foreigners in Japan frequent) is abuzz this week with news of the bankruptcy of GEOS, one of the old "big four"chains of English schools that span the country. At its peak, GEOS had about 500 schools in Japan and around the world (they even have a branch in Victoria), though they had been in decline for the past few years and only had about half that many schools in operation at the time they filed for bankruptcy protection. Anyway, the reason I'm blogging about this is becuse GEOS was the company that - way back in 1999 - gave me my first job in Japan. There were a lot of things I didn't like about working for GEOS, there was an element of snake-oil salesman in their business practices that never sat well with most teachers. Nonetheless, over the course of about 30 years it provided a few thousand freshly-minted university grads from the English speaking world like myself with an opportunity to see a part of the world most wouldn't otherwise have ever seen. All you needed was to have a university degree, be a native speaker of English, and be personable enough to make it through the 3-day interview process and then BAM! - off to Japan with you with a job, apartment and whole new life waiting for you when you arrive. What 22 year old with even the slightest bit of adventurous spirit could resist? So the news of the bankruptcy wasn't too surprising, as they had been closing schools all over the country for the past couple of years. If this was just one company going bust due to its poor business practices, I wouldn't be that upset about it. But really the GEOS bankruptcy is part of the massive collapse of the entire English teaching market in Japan that has occurred in the past 3 years. The statistics are pretty frightening. In 2006 (according to government statistics) there were 826,000 students enrolled in Language schools in Japan. This year there are only 335,000, meaning the market has shrunk about 60% in that short a time. At the same time, the number of full time English teachers (foreigners employed by private sector schools like GEOS) has gone from a peak of 9,100 in 2003 to a measly 3,500 last year. Of the old "big four" chains, two are now bankrupt (GEOS and NOVA, which went under in 2007) and the other two are facing an uncertain future. There are a lot of reasons for this collapse. The recession has sapped people's disposable income, so a lot of students who were studying as a hobby have undoubtedly turned to bird-watching or some other less-expensive pursuit. Government subsidies introduced a few years back to encourage workers to upgrade their skills (including English) by covering up to 80% of the cost of tuition have also been done away with, which undoubtedly also hurt. And of course Japan's demographics haven't helped, with the total population having shrunk by almost 200,000 people last year the market for everything is literally shrinking. Throw in some major scandals - particularly those surrounding NOVA's bankruptcy which left hundreds of thousands of students (NOVA had almost half the market at the time of its collapse) stiffed on tuition fees they had paid in advance - and its not hard to see why things have gone down so quickly. The upshot of it is that the type of opportunity that I had to come here to teach English back in the late 1990s simply doesn't exist anymore. Back then all of the big four had hiring offices in North America and I got hired not once but twice in Vancouver (the second time in 2001) to go teach English in Japan. Now all the hiring offices in Canada are closed and the companies that haven't gone bankrupt only hire new teachers who are already in Japan (or at least they would if they were hiring, which they aren't, as a boatload of now unemployed GEOS teachers are probably discovering). So there it is, the end of an era. It is still possible for recent grads to come over to teach, but only if they can arrange their own visa, finance their own travel, find their own apartment and then battle it out for one of the few teaching jobs available with the army of experienced teachers already in the country. Or if they can get into the government run JET program, which may be the only one that still hires teachers overseas (and they've been cut back over the years too). The glory days are truly over. News of big companies filing for bankruptcy is definitely disturbing. Because each company stands for a specific business, it's evidence of how well or how badly the business is doing. I'm sorry to hear that your old company hit the skids. Do you have any news on how it's doing these days?